For the price range that you’ve selected, the following cars are your stepping stones to the world of sedans. Most of the sedans in this category share their lineage to hatchbacks, meaning that these cars are essentially a hatchback with space extending trunk added. In a country where owning a ‘big’ car gives one a sense of pride, the compact sedan is a popular choice which does not break one’s bank. Most of these cars have been worked on extensively to give them a different character than their Hatchback cousins, but some things remain (in most cases the front end design). The segment has grown exponentially thanks to the governments excise-duty cuts for vehicles measuring less than 4-m in length and the demand for affordable sedans, which means that there is cut-throat competition and a big list of options that can lead to utter confusion. Don’t worry, we are here to help! Read further to see which are the best cars to buy between 5-8 Lakh Rupees in the compact sedan segment. The cars we are comparing today are the Honda Amaze, Hyundai Xcent, Maruti Suzuki Swift Dzire, Tata Indigo eCS and Tata Zest. All the prices mentioned below are ex-showroom Delhi unless stated otherwise. 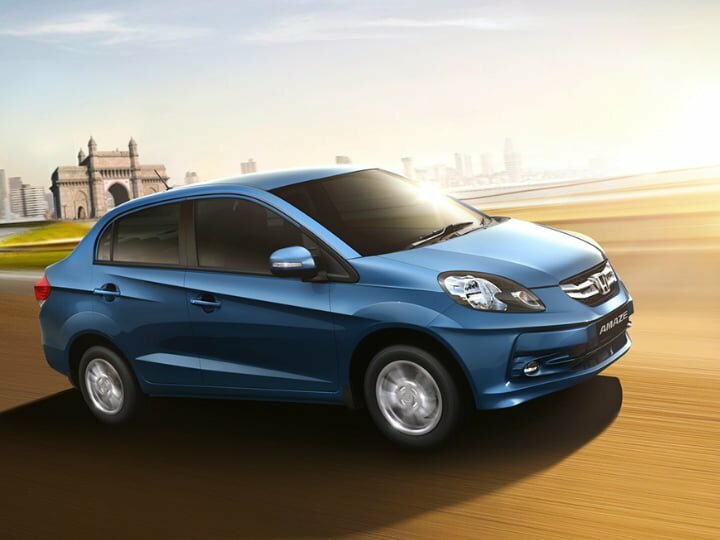 The Honda Amaze is based on the Brio hatchback and that shows in the design too. 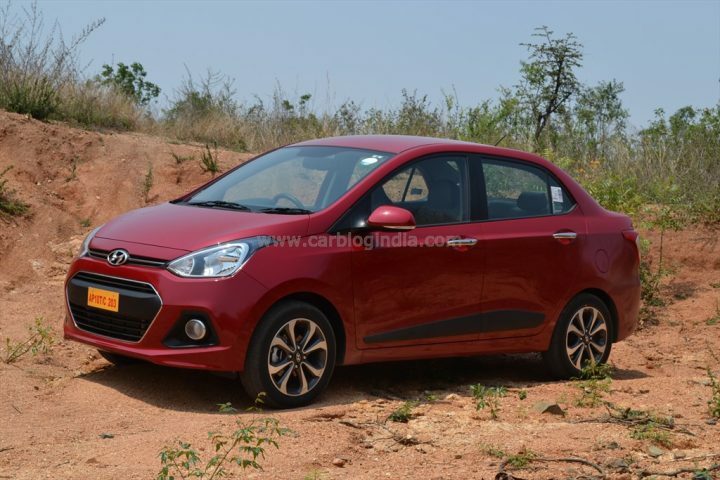 The front fascia looks exactly like the Brio except for some styling changes made to differentiate it from its hatchback cousin. Changes begin to appear from the rear door onwards. The boot has been nicely integrated with the hatchback styling at the front; it is a bit rear-heavy when looked at from the side though it doesn’t matter much. Things like the chunky chrome grille, ORVM integrated turn-indicators, sharply rising body-lines, chrome bar on the boot and the boot-lip add to the good looks of the car. The dashboard design may not be everyone’s taste, it has a mixture of different design themes that do not gell well together. The brown plastic used on part of the dashboard also stands out like a sore-thumb. The sharply rising windowline may not be a good thing for the rear-passengers as the view outside is restricted, especially for the shorter passengers. Honda is known for it’s spacious cars, and the Amaze is no different. The wheelbase of the car has been extended by 60mm over the Brio, this helps free up a lot of space. The seats, both front and rear are well designed and will be comfy over long distances. The leg-space for passengers is more than sufficient. Storage spaces around the car help keep knick-knacks in place. The 400-litre boot is cavernous and can accomodate a moderate family’s weekend trip luggage. The quality of materials used inside will be a bit of a let-down for people who compare the cars in this segment, and it’s especially surprising considering that this is a Honda product. The plastic used on the dashboard is tough but is a bit too hard. The 2-DIN audio system and the manual A/C controls feel a bit of a let-down when compared to the competition. NVH levels, especially on the diesel variants is higher on the Amaze as compared to the competition, which is another letdown. The diesel clatter is noticeable when idling and road noise creeps in when the car is in motion. 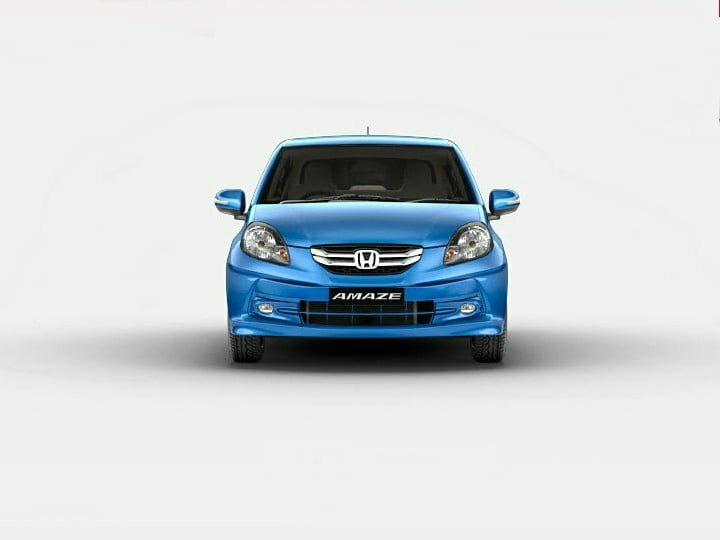 Driving dynamics of the Amaze is one of the best in the segment. Drivers will appreciate the low-seating, good-visibility thanks to the large windows and low dashboard, the responsive steering, short-throw gearbox, good-engines and the good suspension setup. The Hyundai Xcent, like the other cars in it’s segment is based on a hatchback; in this case the Hyundai Grand i10. On the outside, especially from the front, it is a bit difficult to differentiate between the Xcent and the Grand i10. At the front, the only differentiating factor is the chrome surround around the lower air-dam. The boot has been neatly integrated onto the car, this is one of the nicest overall design we’ve seen in the segment. The design of the Xcent is smart, right from the small grille, large air-dam and compact headlights to the simple side to the rear which features large tail-lamps etc. The simpleness of the design also adds to the premium look of the car, which is refreshing change from the overload of chrome bits everywhere on other cars in this segment. Hyundai has been concentrating on making their cars feel more premium and that shows in the design inside the Xcent too. The dashboard is well designed and everything fits well. The two-tone colour has also been carried out well, the beige compliments the black plastics well.The fabrics used on the seats also brighten up the cabin. The rear A/C vent juts out a bit, but is not eye sore. 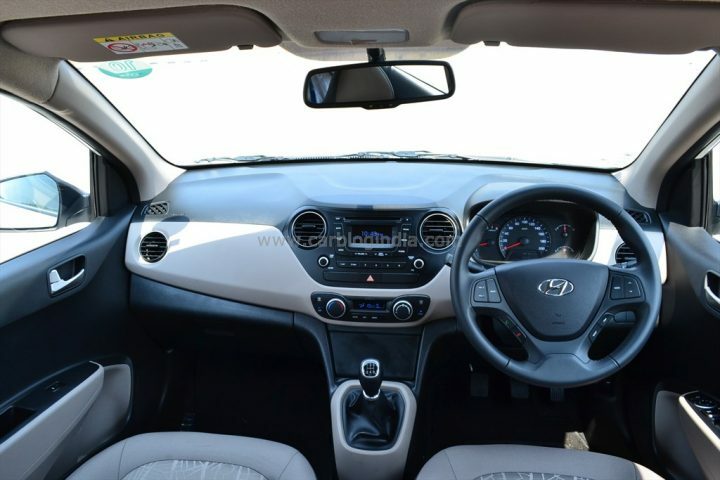 The Hyundai Xcent is surprisingly spacious inside even though it has not been extended as compared to the Grand i10. 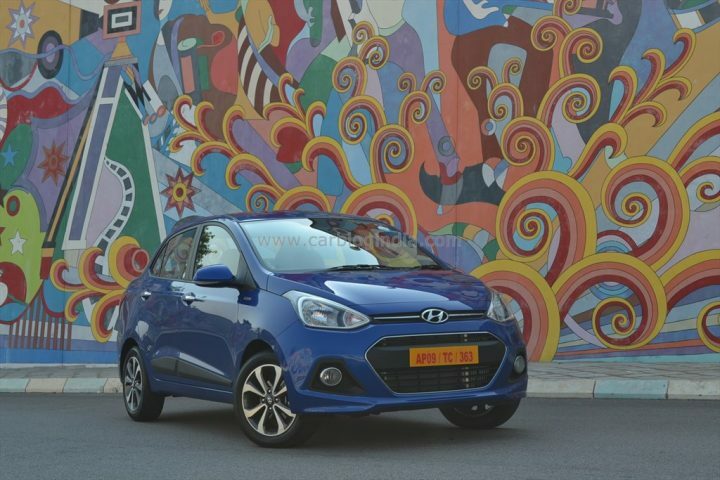 The Grand i10 itself is a large car on the inside and the same applies for the Xcent as well. The seats at the front are well bolstered but a bit firm, this helps on the longer rides. 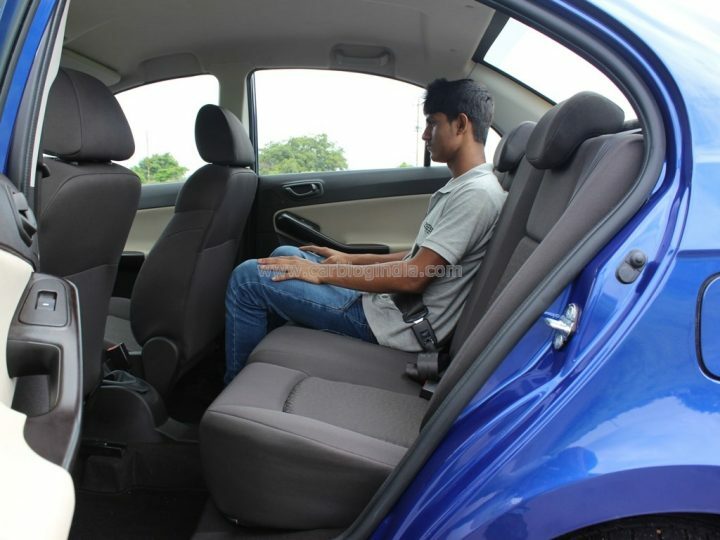 The rear seats are well bolstered too, but some may find the seat-back angle a bit too leaned back. The cabin is a bit narrow though and it best to seat 4-people in the car, though leg-room is not an issue. The materials used around the cabin are very good and feel nice to touch. The steering wheel cover is soft and feels nice to hold. The rear A/C vent makes a lot of difference, enabling the A/C to direct cool air around the cabin of the car faster. The almost flat window-line will also be appreciated by the passengers at the rear, who do not have to crane over the window-will to look outside. The large windows also let in a lot of lights and make the cabin feel airy. The Xcent does not suffer from the bobbing rear suspension that affects the ride of the older cars from the company, this leads to a more relaxed ride. The steering is not very direct on high speeds, but is a breeze to use in the city. The NVH levels on the car is good, even on the diesel variants. 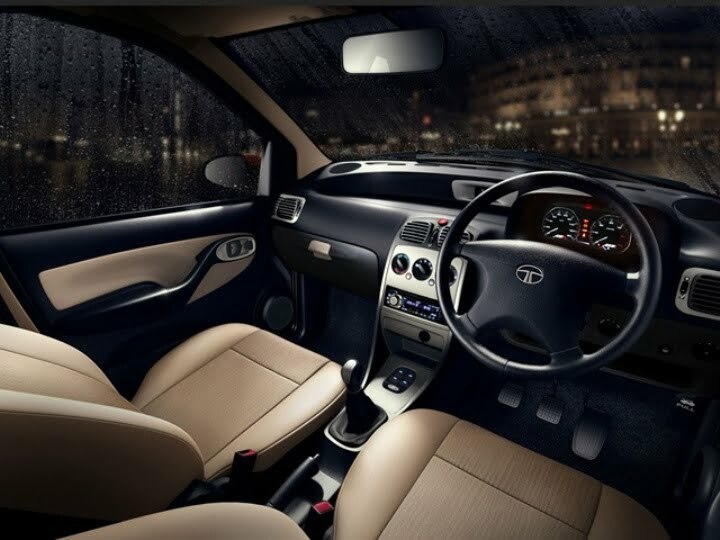 Drivers will find the Xcent a pleasure to drive around town, the dash-mounted gear-lever is easy to use, the clutch is light and the engines are energetic. On the highway, the car is not as sure-footed as it is at lower speeds but it isn’t scary. The steering feel at higher speeds is not confidence inspiring. 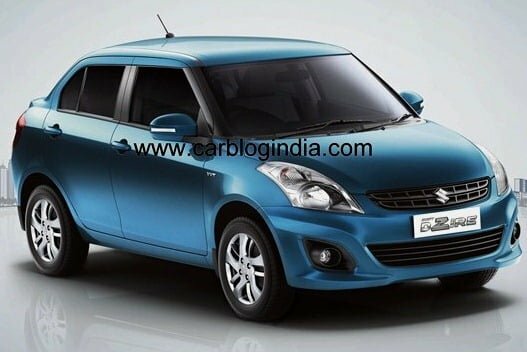 One of the older designs in this comparison, the Swift Dzire is a good looking car even today. The boot is better integrated on the Dzire now as compared to the older car. There’s not much to say about the design outside; the swept-back headlights, the ‘floating-roof’ design and stubby boot are good design elements. Move inside and the black-and-beige combo adds a much needed airiness to the cabin. the previous model had all-black interiors which made the inside gloomy. The design of the dashboard has been changed, but is simple and easy on the eyes. The faux-wood adds a bit of ‘premiumness’ to the cabin. 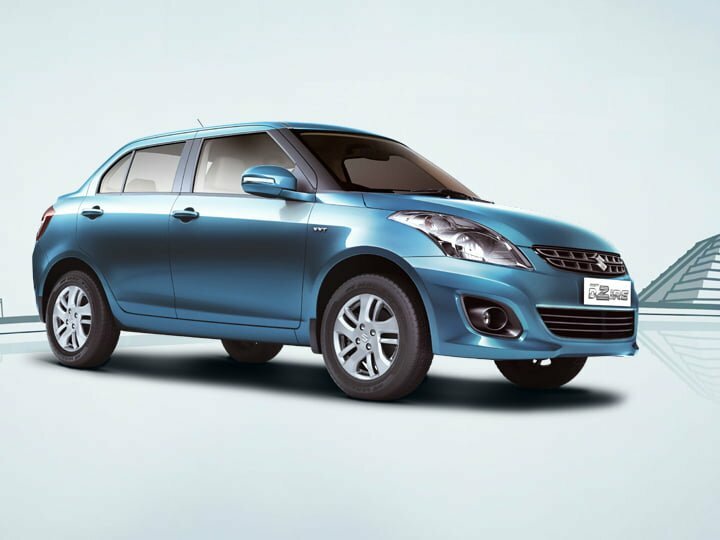 The Swift Dzire is one of the best selling cars in this segment and that is because it combines a good product with Maruti’s reliable service network and low after-sales service costs. The Swift’s popularity is because of the combination of a fuel-efficient but responsive diesel engine, one of the best ride-qualities in the segment and a good mix of equipment. What it lacks though is rear-seat space. Just like the Swift hatchback, Maruti has had to compensate for boot space by keeping the rear-seat space low. It can get pretty cramped at the rear if the front seats are occupied by tall people. The Swift twins are fun to drive, the suspension setup is a bit soft on the Dzire but that doesn’t hamper the stability much. The tall-seating position of the driver, the responsive steering unit and short-throw gearbox are a joy to use. The clutch on the diesel variants is a bit heavy but it doesn’t take much to get used to. The diesel also suffers from a bit of turbo lag below 2000 RPM but the shove becuase of the torque surge after that is smile inducing. The Indigo eCS is one of the oldest cars in the segment design wise. 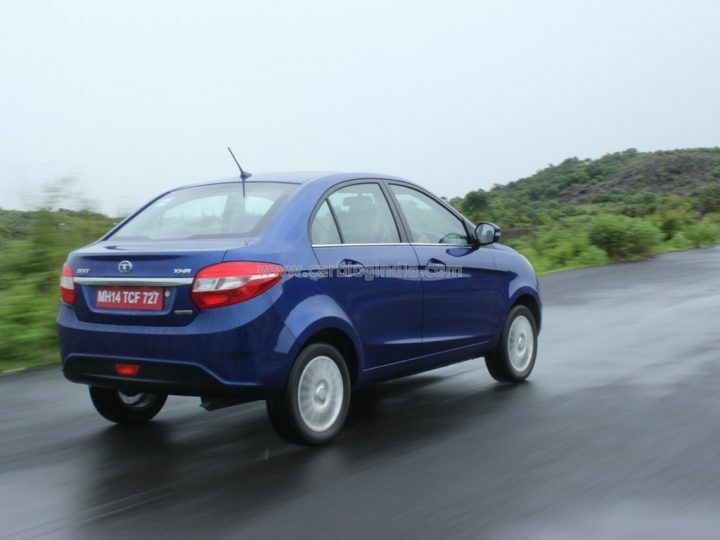 The basic design of the car not changed since Tata launched the Indigo in 2002, which is a good thing and a bad thing. 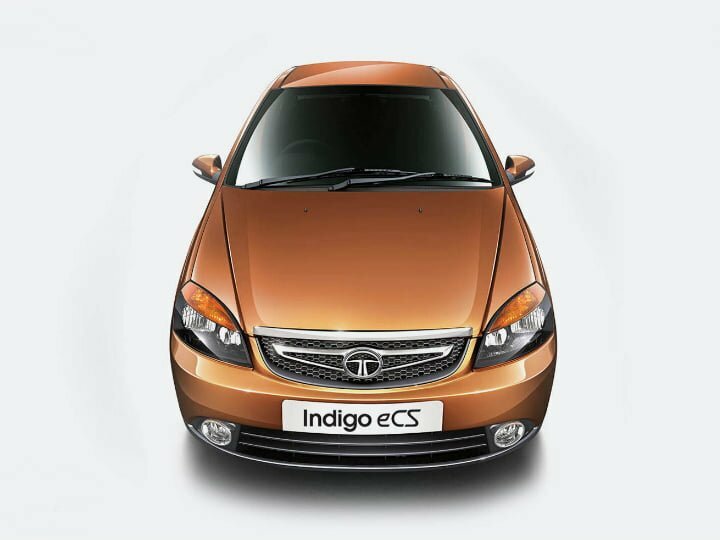 The overall design of the Indigo eCS is not bad; the front is characterised by the blacked headlamps, a prominent grille with the chrome strip above etc. The boot is well integrated with the rest of the car, the stubby boot flanked by the multi-element tail-lamps look good. The car’s age shows through inside it too. The large steering wheel, silver centre console and hard black plastic dashboard fail to excite. The placement of controls is not intuitive and further lowers feeling that you get when you sit inside the car. 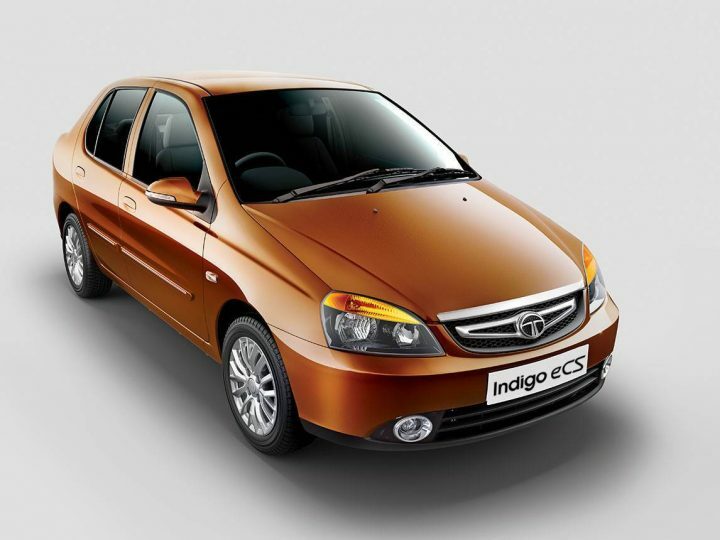 Tata was one of the first manufacturers to bring a compact sedan to the Indian automotive scene but lost out as it failed to update the car with the times and though the Indigo eCS is a good product it’s old design doesn’t attract too many people now. 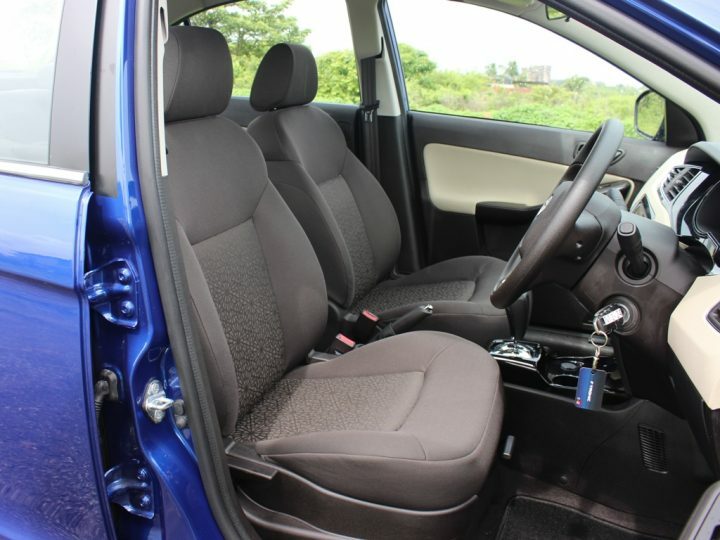 The best thing about the Indigo eCS is that it is still one of the most spacious cars in this segment. The space at the rear cannot be beaten by any other in the segment. 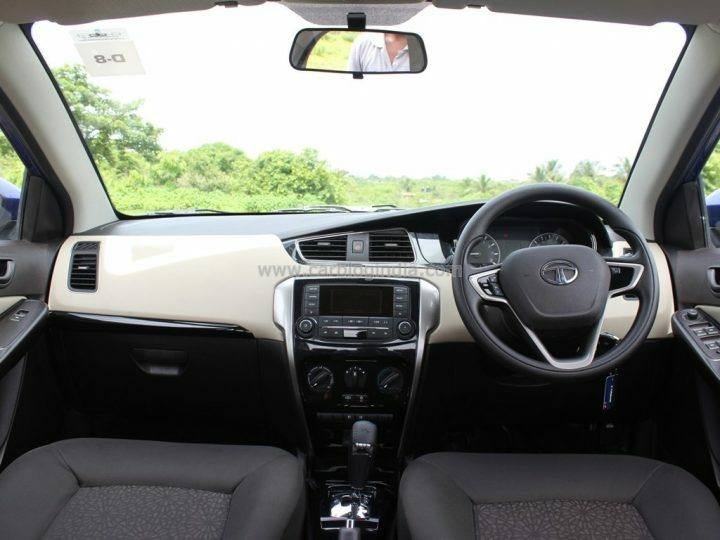 The driver may not enjoy driving the car though, the eCS still suffers from weird placement of the pedals, a over-sized steering wheel and a notchy gearbox even though Tata has worked on improving the same. The suspension is soft and pliant but don’t expect the car to react well to enthusiastic driving. Go for this car if you need a car which will stand a lot of abuse without breaking down and can be repaired at most road-side garage. It is not a premium product at all, but is a godd buy for those wanting a value for money, hard-wearing car. 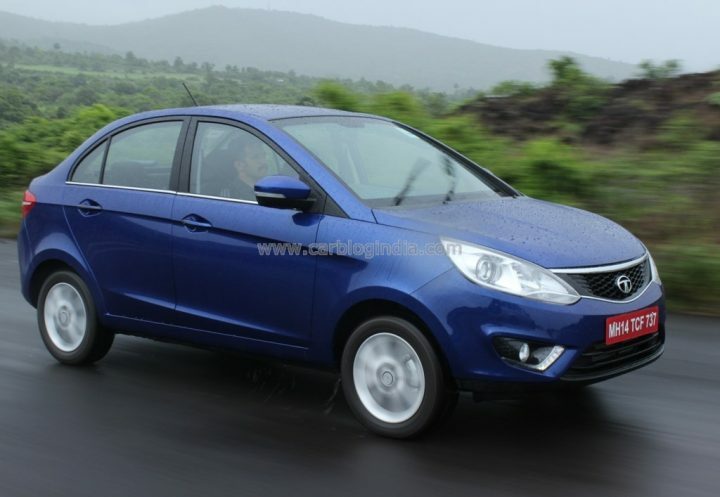 The Tata Zest introduces a new design philosophy for Tata motors passenger vehicles department. It is an evolutionary design if seen from some angles but that is because the company wanted the car to be still recognised as a Tata product. From the front the car definitely looks good, the multi-element headlamps, with integrated projector lamps and indicators give the car a smart look. You can see the wedge-like shape that has been given to the front when the headlamps and grille are combined. The grille is topped by a chrome strip which is not too garish and gels well with the all black honeycomb grille. The bumper is dominated by the lower air-dam which is flanked by fog-lamps, which on the higher variants gets integrated DRLs. The 15-inch alloy wheels look good too. The car looks the best from the front 3-quarter which shows off the smart front, the spacious looking cabin area and the stubby boot. Move to the side and you see two lines which keep the body from looking boring. Chrome strips along the bottom of the windows give it a premium feel, which is also a given in this segment. Move to the rear and we get mixed signals; individual design elements like the LED rear position lamps, thick bumper with integrated fog lamp, boot-integrated number plate holder and a strip of chrome make the rear pleasant. The rear tail-lamps though can divide opinions though, some of us find them too big. 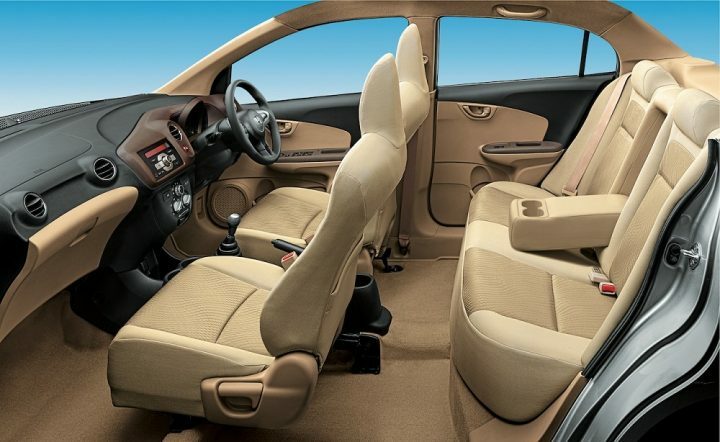 Moving inside, the Tata Zest is miles ahead as compared to previous products from the company. The design is very mature, stuff like the dual-tone dashboard, asymmetrical centre A/C vents, three-spoke steering wheel with integrated multi-function buttons make the car look good. The instrument cluster is very easy to read and has an integrated digital screen which shows driving related features. 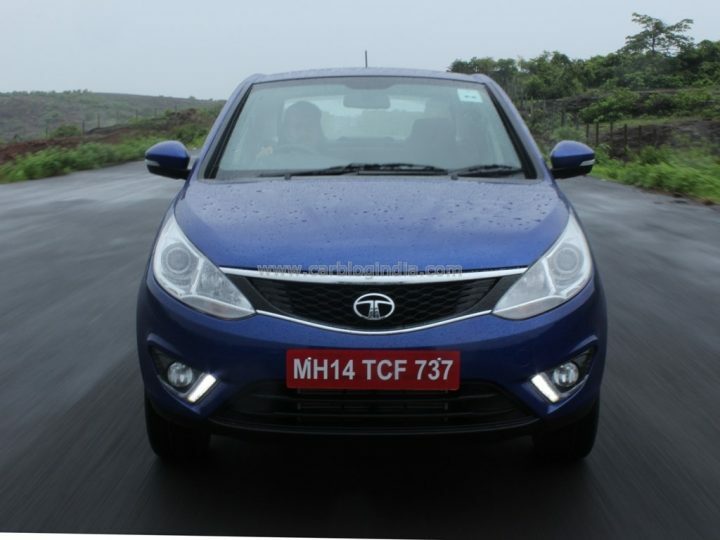 Tata cars have been always been class-leading good in terms of interior space and the Zest improves on this area. The materials used inside give the cabin a good feel, the dual-tone black and beige trim gives the car an airy feel and the design looks smart. The plastics around the cabin feel good to touch, there are no sharp surfaces as such but we did find one fit-and-finish issues on the diesel variant; considering that we were hard pressed to find any niggles with the car, we can safely say that the Zest is a leap forward in terms of fit-and finish as compared to previous cars from Tata. Getting in and out of the Zest is easy, the wide opening doors, low sill and lots of legroom help out a lot. The front seats are very snug and hold you well, preventing you from sliding off if you take a corner too aggressively. The driver will find the new three-spoke steering wheel a joy to hold, it has built in grips at the 10′ o Clock and 2′ o Clock position and is not too large in diameter. The steering can be adjusted for rake and along with the seat recline and seat reach adjust provide for a good driving position, there is no dead pedal available on any variant. The rear passengers will find the soft seats at the rear pleasant to sit in, but we think this could become tiring on long runs. The seat-back angle is good, the thigh support is adequate, legroom is fantastic and so is the headroom and shoulder room. It will not be a problem seating 3-medium sized people side-by-side in the Zest, though the centre passenger will find the tall central tunnel is a bit of a hassle. Those who think that not having a rear A/C vent is an opportunity lost by Tata can think again, as the front A/C vents cool the cabin effectively. Driving dynamics of the car is on par with the other cars in its segment. Bumps and undulations are handled by the suspension noiselessly at any speed, only very sharp ruts filter through with a damped ‘thud’. The Electronic Power Assist Steering (EPAS) unit is responsive at all speeds and instills confidence even when cornering hard. Safety systems like ABS and Corner Braking Stability (a first in this segment) keep things tidy even at high speed corners, even when the road is slippery wet as was the condition in Goa when we were testing the cars. The drivers will love new systems incorporated by Tata, like the dual-path struts and anti-pivot system which give great steering feedback, reduce steering shake at high speeds (remember the old Tata Indica?) and improves stability. Drivers of the diesel AMT will enjoy these features but will wish that the AMT was not so sluggish. The Zest petrol variants though, are the ones you want to go for if you want a more driver oriented car; the Revotron engine (on sports mode), the five-speed manual and the improved dynamics make it one of the most fun to drive compact sedans in the market.